You know those nights? The nights when you’re already exhausted and you’re not even home yet. Maybe those are days for you too. Those are the time for simplicity. 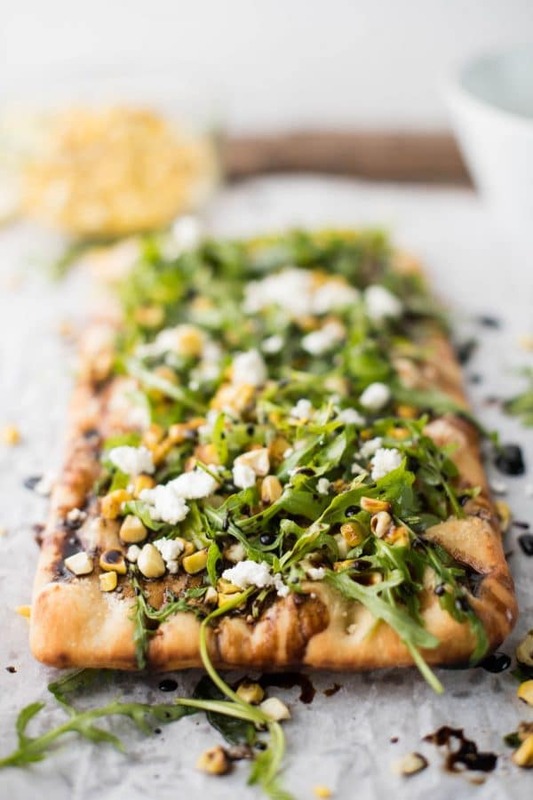 A simple dinner, lunch, snack or appetizer is just what’s on order and here’s the answer – Simple Summer Flatbread with Grilled Corn and Arugula. It’s no wonder you guys made this Quick + Creamy Cranberry Brie Flatbread the most popular post on the blog. It literally takes minutes to throw together, much like our new crunchy and creamy Simple Summer Flatbread we’ve got going on today. Purchase the pre-cooked flatbreads at your local store. My personal favorite brand is the Stonefire Artisian Flatbread. They are rectangular and easy to heat up in the stove, toaster oven or on the grill. Since we’re grilling the corn anyways, you can throw those bad Larry’s on there too and not heat up the whole house. If you don’t have access to a grill, but have a toaster oven that can be used as well if you don’t want to turn on the oven during the height of summer heat. Depending on the size of your toaster oven, you might have to give the flatbreads a cut but that’s a-ok.
Give the corn a quick brush with oil to get a good char on the outside without burning. If you don’t have access to a grill, well drained canned corn can be substituted and takes even less time. Prepare the flatbreads with the cheeses so as soon as your corn is grilled you can toast those up in under 10 minutes. The combination of flavors and textures on this flatbread are what really make my tastebuds sing. Then you add in that whole ‘simple’ part to just seal the deal, you know? The flatbread itself is chewy, but after toasting with the cheeses it’s chewy, crispy and creamy. Ugh, dreams right there. The grilled corn is sweet and smokey and provides a fun ‘pop’ with each bite. Meanwhile, you’ve got that arugula being all spicy with just a smidge of lemon and olive oil. For good measure, let’s add a little extra goat cheese on top. You know, just to be sure. Oh and what the hell, let’s drizzle it all with bomb old school aged balsamic. This stuff is my kryptonite. Aged so it’s naturally sweeter and less acidic – like yours truly ::wink wink::. I love it on all the arugula things like Arugula Caprese Salads. If you can’t get your hands on an aged balsamic – I usually find mine at an Italian specialty store down the street (hooray for supporting small businesses!) – but you can also make something similar by reducing balsamic vinegar and sugar over low heat. You can grab that recipe here: Burrata with Arugula and Strawberries. 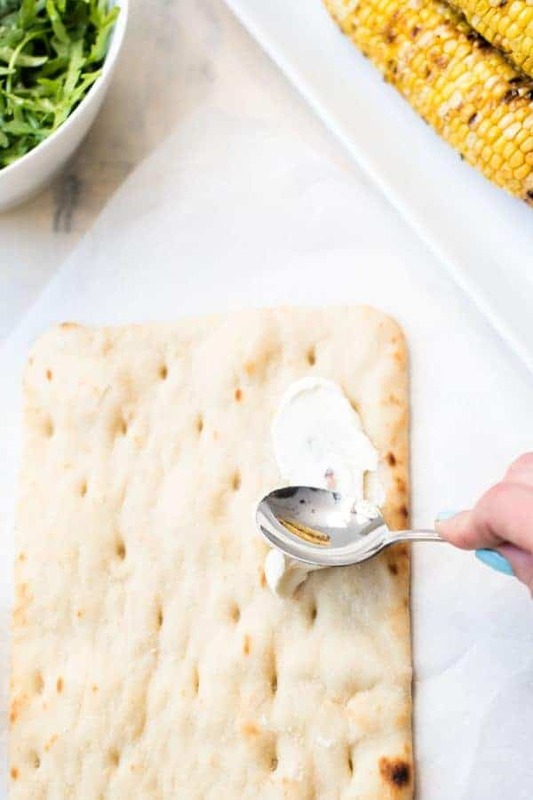 Beyond a quick dinner, this Simple Summer Flatbread is perfect for brunch or an easy and quick side dish to bring to a gathering. There’s so much fun stuff to do this summer, let’s make just one thing easier, shall we? Did you try this recipe? Tell me about it! What are your favorite go to quick summer dishes?! 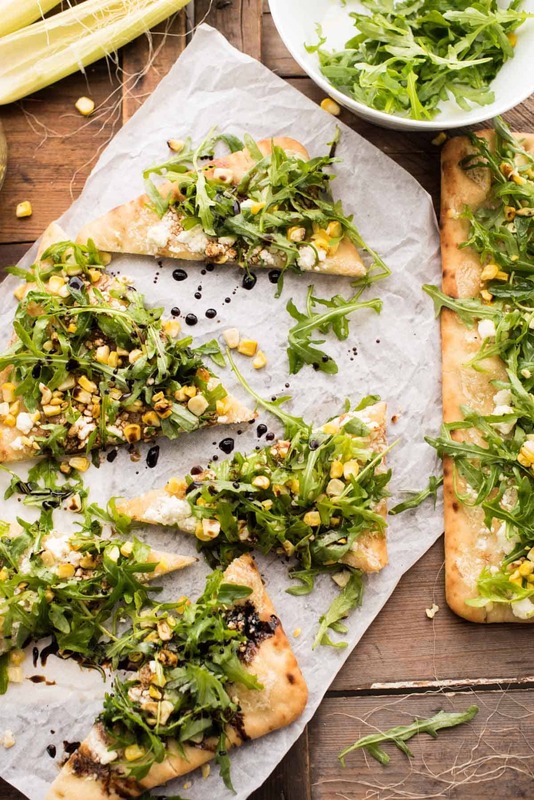 Simple Summer Flatbread with Grilled Corn, Arugula, Mascarpone + Goat Cheese. Just the right amount of crunch, creamy, sweet and savory – made in a flash! Prepare the corn: preheat the grill to medium heat. Brush the ear of corn with 1/2 tablespoon of olive oil, reserving the rest for the arugula. Grill the corn on all sides until some of the kernels have charred (are slightly burnt) and all the kernels have turned a vibrant yellow. Depending on the temperature and set up of your grill, time will vary, should be about 5 minutes per side. Let the grilled corn cool off until you can handle it, and cut the kernels off the ear. Prepare the flatbreads: Using the back of a spoon, scoop the mascarpone cheese out of the container and spread on the two flatbreads. Sprinkle the two flatbreads with 1/2 cup of goat cheese crumbles. If using a conventional oven, preheat to 425°F. Bake directly on the rack 8 to 10 minutes until the bottom is crispy and the cheese has melted. If using the grill, bake directly on the grill on just one side for 8 to 10 minutes until grill marks appear and the bottom begins to brown. Finishing the flatbreads: In a medium bowl, toss the arugula with olive oil, lemon juice, salt and pepper. 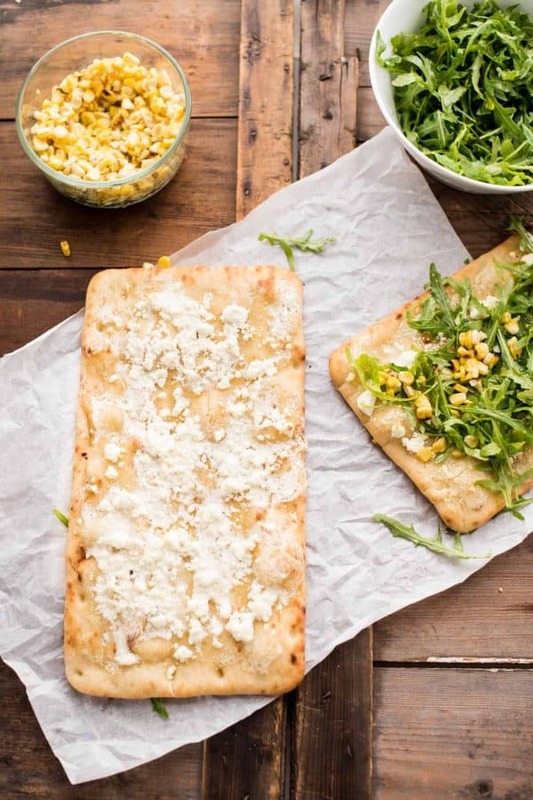 Top each flatbread with the arugula and remaining goat cheese crumbles. Optional: Finish the flatbreads with an aged balsamic or balsamic reduction drizzle. Cut with a pizza cutter and serve immediately. If bringing to a party, bring the arugula and remaining goat cheese on the side and finish on location so the arugula doesn’t get wilty. ¹If grilling is not an option, you can absolutely substitute canned corn drained very well. ²Follow the conventional oven directions for the toaster oven. ³Flatbreads should be enjoyed right away, but can be stored in an airtight container for up to 3 days. If reheated, add a little fresh arugula on top. I am addicted to flatbread!! I always purchase it too. So much easier! Love you tip about the toaster oven. I wish I had one! Oh man, I cook everything in my toaster oven in the summertime! Makes lousy toast though ???? I love a cheat, especially on a weeknight. A leaf topped flatbread adds so much freshness. So excited for Summer goodness. I can’t wait for corn season to be in full swing! I absolutely adore grilled corn, and this looks like such a fun way to use it! 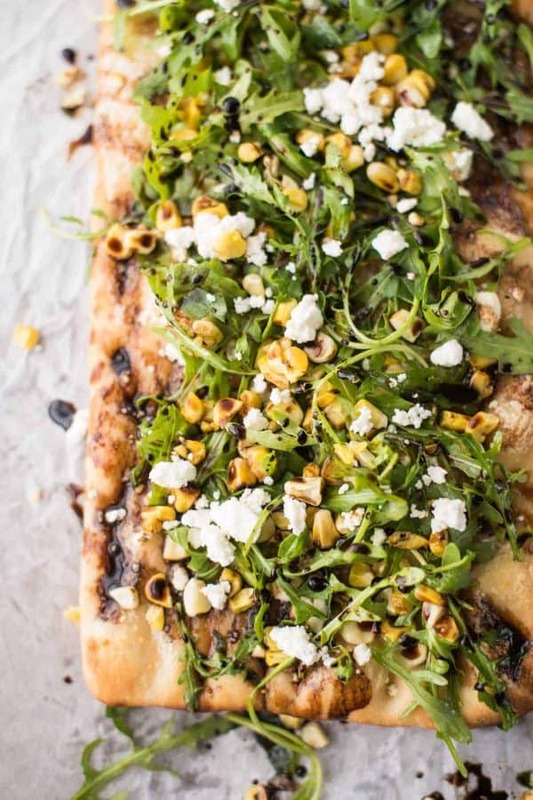 This flatbread is SO perfect for summer. I love the sweetness and texture from the texture of the corn. I’m adding this to my to-make list! Umm this looks delicious!!! I am obsessed with flatbread and love how easy this is! I love the simplicity of this appetizer and the flavors just scream summer. There is nothing more rewarding then skipping the oven during a hot day and having the option to make something healthy with fresh, flavorful flavors. Pinned for later! 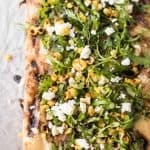 Yup, summer season is definitely in, and your timing is perfect because I’ve been testing flatbread recipes and you just gave me a new one to try out! That looks like an amazing combination! I love the grilled corn and bitter arugula and sweet balsamic, and… Sounds fairly simple, too. This flatbread looks incredible! love all the fresh summer ingredients you used, this would make such a great lunch or appetizer to share. What a beautiful Summer recipe! Can’t wait to fire up the grill & try it out!